the march glymm box was filled with a wide variety of items. some were, ahem, very interesting. i wasn't sure what to make of it at first but, overall, i was very happy with what i received! this month's glymm box was definitely full of surprises. this item caught my attention right away. i definitely was not expecting to receive purple hair extensions! at first, i was like, whoa... and not in a good way. but then i took them out and held them up to my hair. and i thought they actually looked really interesting. i can tell you right now that i won't be attaching these to my hair with pliers. instead, i am going to find a way to attach them onto bobby pins so i can re-use them and switch up my look from time to time. impressions: i've found a way to attach my feather extensions onto bobby pins but i'm going to buy some stronger pins first (my current ones are crap). 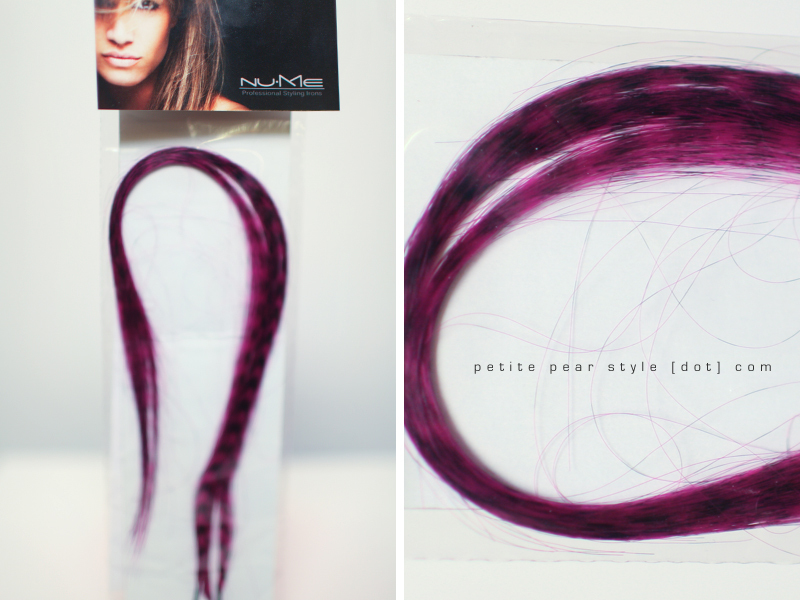 i would never purchase purple extensions for myself so i am happy they were included in my glymm box. this product was not listed on the card so i am assuming it was thrown in as a bonus sample. i had actually received the same sample in my december glymm box and i really liked it so i am happy to try it again. i had never heard of this brand of nail polish but, after doing a quick swatch, i am impressed with the ease of application and evenness (no streaks)... especially with such a light colour. it is also super fast drying. i bumped my nail on something almost immediately after swatching the nail polish (story of my life) and it was already dry enough so there was no impact. according to the card that comes with the glymm box, this brand is sold in upscale salons in the US and europe but a quick google search did not reveal any information about the brand. it would have been nice if glymm had included some details about where to purchase this product. impressions: i am happy with the shade i received as i have started wearing neutral nail polish to work during the week - this fits the bill perfectly. i would consider re-purchasing this brand but i'd like to see the full line up of colours first. we received an offer for a free full size hydrafull lip gloss if we purchase 2 anastasia products from the glymm beauty boutique. i was really happy to receive a little sample of the lip gloss to try so i could see if i liked the formulation. i swatched the lip gloss and was intriqued by the paddle applicator. i had never used this type of applicator before - it's a rubber type texture and flexible to pressure. 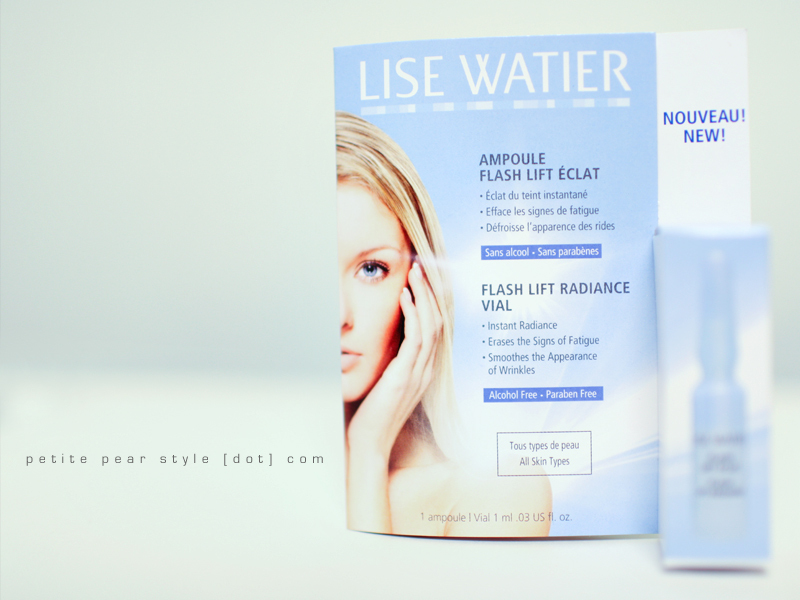 i found it okay to use - not better or worse than "regular" applicators. when i swatched the lip gloss, i was impressed by the colour payoff. this translated well to my lips. the deciding factors for me when it comes to lip glosses are (1) whether the formulation is sticky, (2) whether the formulation is long lasting, and (3) whether the formulation dries out my lips (a big no-no). after recording the unboxing video, i dabbed onto my lips the gloss that i had swatched on my hand... and it was really really sticky. i was disappointed and i was about to write off the lip gloss altogether. 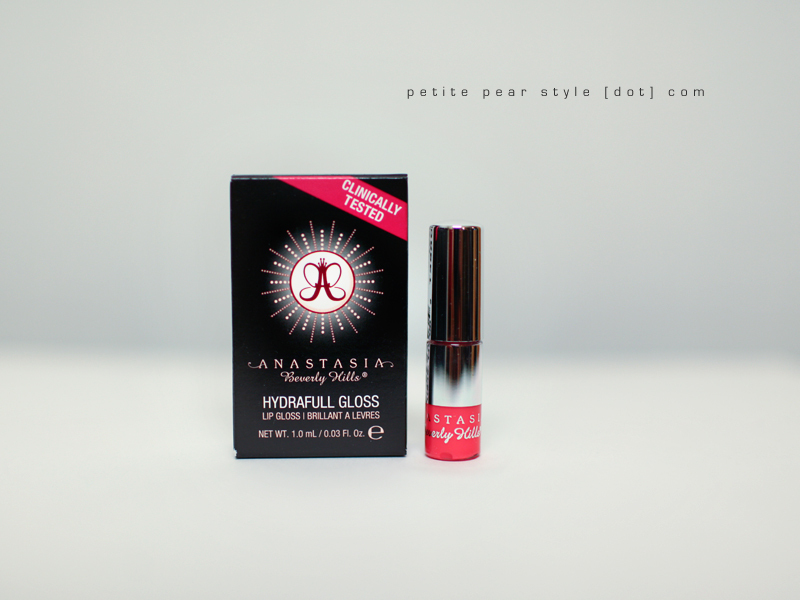 but then i read a few reviews that proclaimed that the gloss was not sticky at all so i decided to try it again. impressions: i wore the lip gloss this morning in place of my regular sula lip gloss. i layered it on top of my revlon lip butter in peach parfait and i am super happy to report that it was not sticky! similar to my sula lip gloss, the hydrafull lip gloss also lasted all morning and was very moisturizing. no peeling lips at the end of the day, thank goodness. i likely would not re-purchase this product standalone due to the price (plus i have about 25 lip glosses i still need to use up) but i am considering taking advantage of the promo. note that the full size product seems really small - considering our tiny sample represents nearly half of the full size. when i first picked up this product, i had no idea what the heck it was. then i opened it up and was even more confused when i saw the colour. now that i've had some time to research it, i still don't know what it is. i've seen other subscribers describe it as a concealer, foundation, bb cream, etc. i would not classify this product as a concealer and i don't have enough experience with foundation or bb cream to comment... so. i. don't. know. 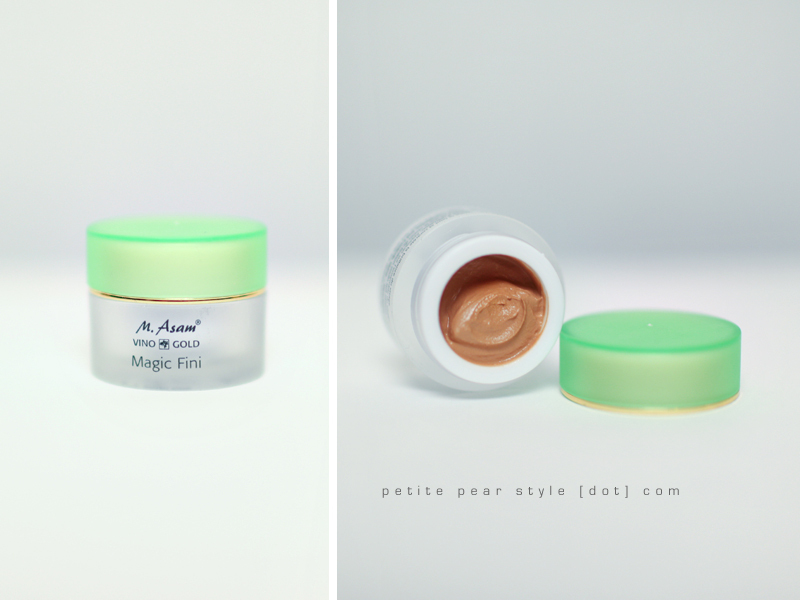 impressions: i tried the magic fini the morning after i received it despite not finding too many details about it online. 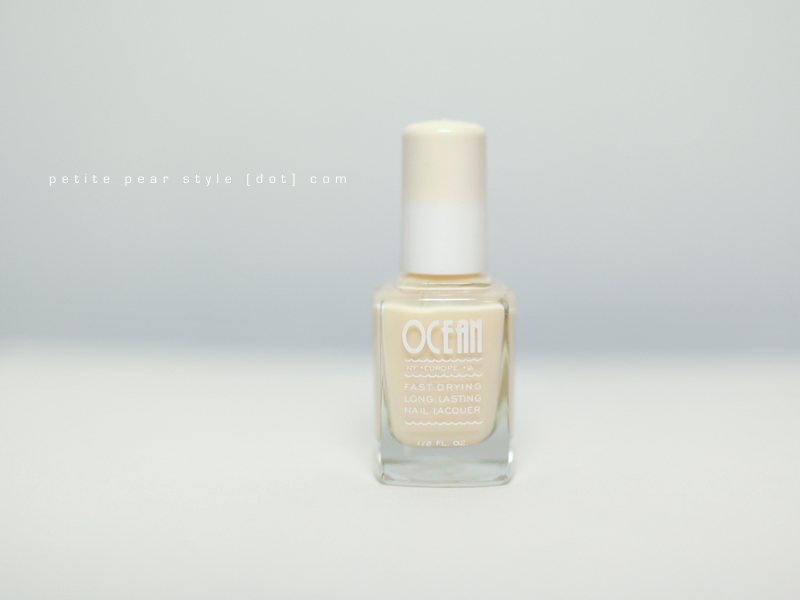 it blended very very nicely with my skin tone! i read that it actually suits all skin tones, which i find very interesting. there is something about the scent that i really like - it reminds me of the scent of the glam glow mud mask. it did mattify my face but i noticed the tip of my nose got a little shiny in the middle of the day. i am going to continue using it and i'll provide a further update soon. 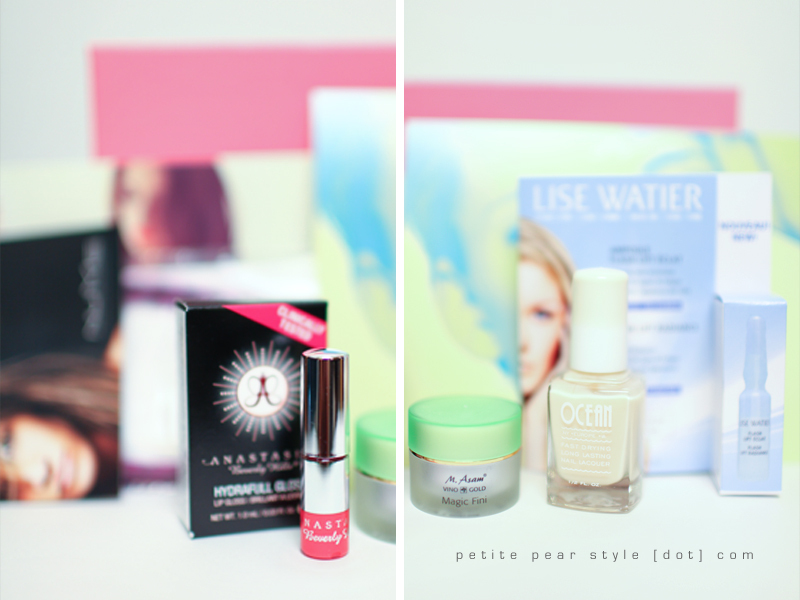 the more i play around with the products included in this month's glymm box, the happier i am with what i received. i thought the samples were really different and interesting - items that i would have never purchased for myself and brands that i had never heard of. 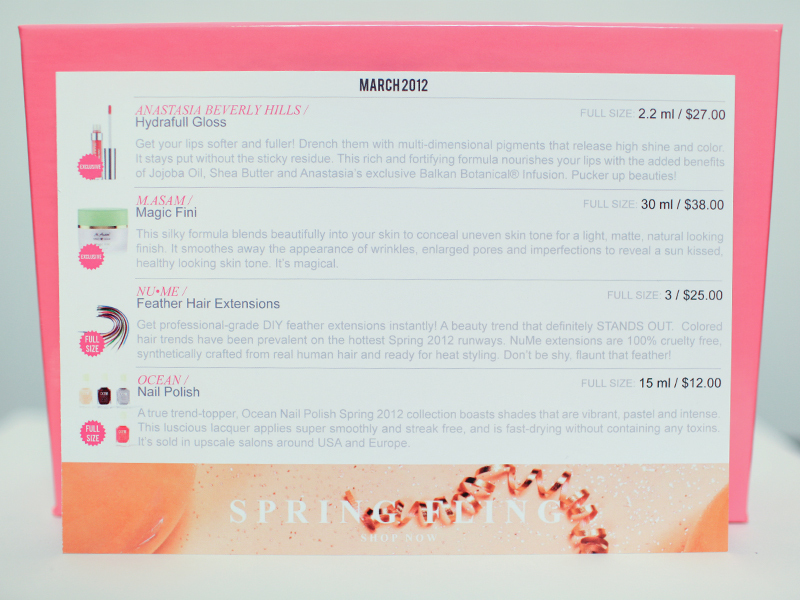 plus they covered the full gamut of beauty products... face, hair, nails, lips. i thought we received excellent value in this month's glymm box. if you received a glymm box this month, i would love to know what you thought of it!